Welcome to the Best Friends Forever Blog Hop! We all have the One (ok, sometimes more than one) person we call our Best Friend. Its that person you can say anything to, laugh the hardest with, and cry without judgement. For all you Besties...this hop is for YOU! 2- COMMENT on all SEVENTEEN stops letting the owner know what you thought of their project! BAMBI! I love Bambi so of course I had to do this cute trio of friends. 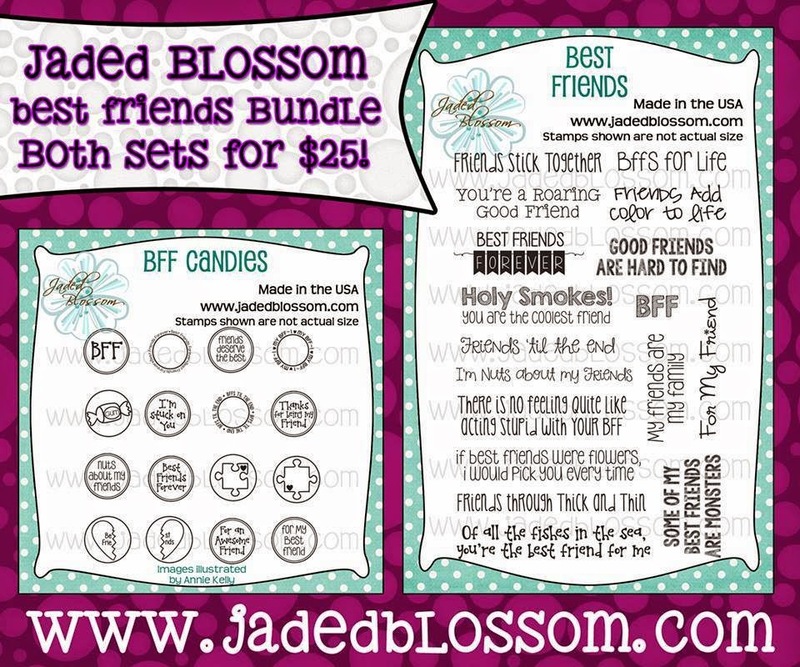 The sentiment from Jaded Blossom is PERFECT for this too! For the background I used the Card Mat dies and Spring Dies (grass). 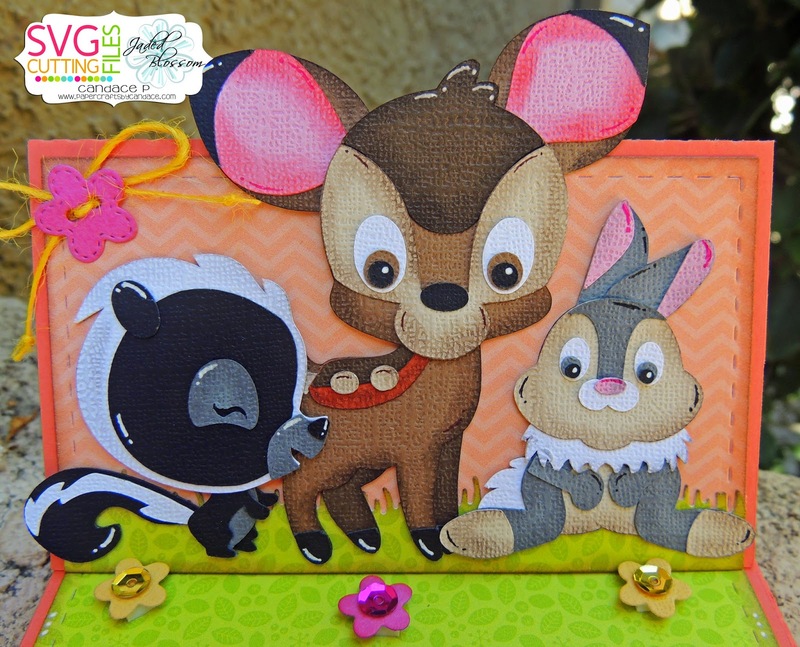 Here is a close up of Bambi, Thumper and Flower. The flowers are also from the Spring Dies. I put my sentiment on the flag die from flag dies 2. 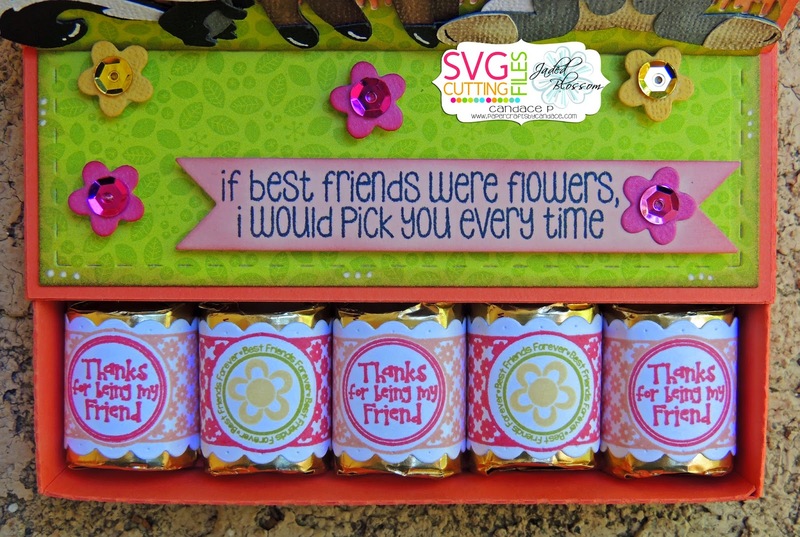 For the nuggets I used Candy Wrap Dies, Spring Candy Wraps, Spring Bingo (for the flowers) and BFF candies for the centers. Thanks so much for checking out my project! Now on to your next stop, click the cute image below to be taken there! EEEKKK!!! You can call me FLOWER if you want to!! Great project!! Absolutely love your project, Bambi has always been my favourite!! Wonderful, who doesnt love bambi eh! love the sentiment. It's Bambi, Thumper, And Flower! I love their cute little big heads. What a fantastic job and I love, love love the colors. Gosh, who doesn't love bambi. I love this, Bambi is my all time favorite!! Awesome treat! I love Bambi and his friends. All time favorite. The sentiment is the best! He can call me flower if he wants too....Sweet movie. Love your project!!! This is just too cute!! Love your nugget box!! What a gorgeous card. Bambi, Thumper and Flower are just precious. I love the shading and lighting detail you have added. The slider is great AND my real life BFF loves Thumper!! Great project. Love that you did nugget trays. They are so much fun! Very sweet little treat box! My first ever movie I watched when I was 2. Love! OMGosh! I love these guys.. my favourite movie ever! You ladies are going to make me cry.....this hop is awesome and love the baby bambi and friends. I love love this movie! and your trio are adorable! OMG!! Who doesn't LOVE Bambi and his friends!! You captured their friendship beautifully!! I LOVE your project!! EEEEK! LOVE LOVE LOVED Bambi growing up!!! This stamp is PERFECT for them!!! Great job Candace!!!! This is so pretty! I love everything about it:) Thank You for sharing. Luv the Bambi movie - especially Thumper. Great project. Thanks for sharing. what a cute card!! I love the drawer card! This is such a great treat box. That deer, rabbit and skunk are just the cutest little friends ever. How perfect is that sentiment for the images! Super cute! How cute!! Love the details!! Can't get any cuter! Love it! Love the project and cannot wait to create with your project and the coordinating stamps! Thumper has always been my favorite! What an adorable treat box. Love these characters. What a fun way to give candy to all your friends with such cute animals! One of my favorite movies. Love the nugget holder. Very cute! I love the Easel Nugget Slider. awww, Those little critters are so cute! Gotta try one of the nugget holders. Bambi and Thumper, my favs! I love it! The colors are so pretty together, and the files are super cute, and I MUST go put this easel nugget holder on my wishlist immediately for next time I buy files. Love the nugget holder and the characters are super cute!! Super Cute! Love it! Thank you for your hard work. 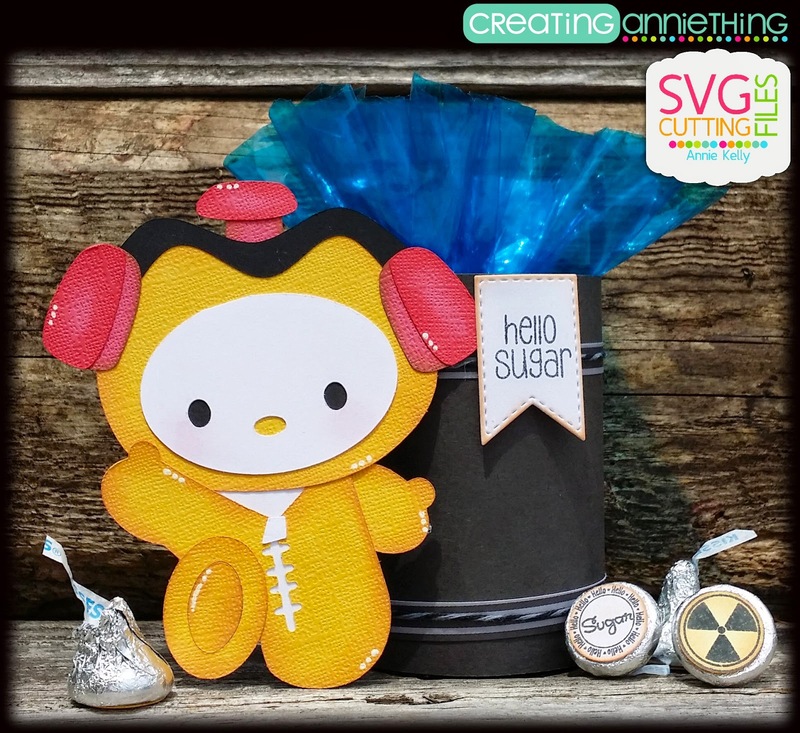 Your project is so sweet! I love Bambi! Love this! I am a huge Disney fan and know just who I could make this for! Bambi... a classic favorite. Great project, very cute!!! I love it, esp. thumper! Love this!! You did an amazing job creating these lovely characters. I LOVE Bambi!! Super cute!! The saying is perfect for this!! SO cute! Love that you included the trio...Bambi, Thumper and Flower! These guys are sooo cute!! I love your Bambi project! So cute! My Fav Disney movie. I'm in Love! Super, super cute! Love it! Super cute. Love Bambi ! Oh goodness, look at Thumper and Bambi!! SOOO cute!!! love it, so darn cute!! Oh My - I am loving these little cuties!!! Oh, so cute, will be doing. OK LOVE LOVE LOVE LOVE I am in love!!! What a wonderful job!! Thumber is my favorite from Bambi! Really cute! Love Thumper! This is way to cute! wow! another set of favorite besties and I've barely begun! Love the new nugget box, perfect for using multiple cut files. Great project. Flower is my favorite! I love it! Bambi and his friends are the best!! I just love Bambi and Friends!! Flower is my favorite character. How cute!!!! I love Bambi! Quintessential BFFs Love it - TFS! He can call me flower if he wants to! Very cute! I love Bambi! OMG! So cute. I love it. So stinkin' cute!!! I am in love! This is a great card/gift combo and so adorable. Love it. My son loves Flower the skunk. So adorable and cute! Amazing job! So cute. Love Thumper. Great job! What can I say, you did an amazing job!!!! Oh so cute! I love bambi and his friends! Great job! Ok...I'm on cuteness overload!!! This is AMAZING!!! How super cute...I just can't get over it!!! Well done!! Great project and Bambi and friend are adorable. Great Job!!! I like the added little flowers. What can I say, amazing job!!!! Thumper is my all time favorite, and this nugget box is great. Thank you for sharing your talent. Amazing job. :) Love it. I think Thumper was one of my favorites growing up! This is too cute! A colorful treat for you to eat.